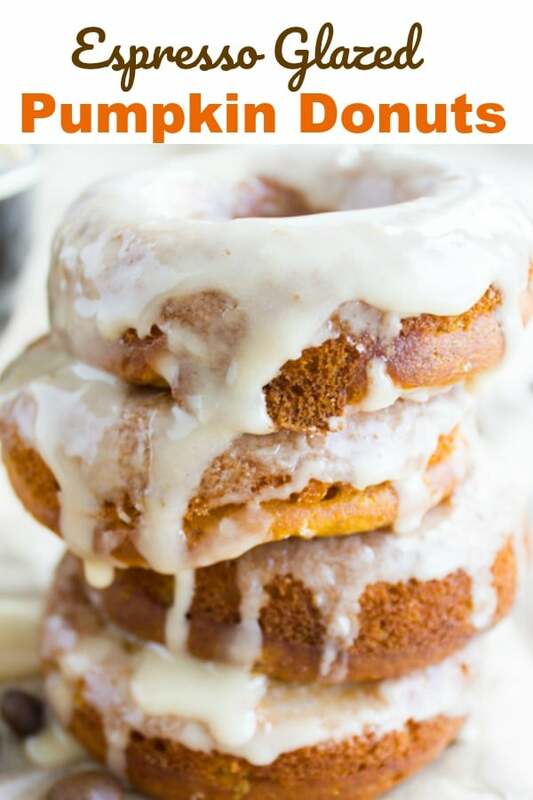 Light, fluffy, and moist these Baked Pumpkin Spice Donuts make a perfect fall breakfast, office snack or even a non-traditional Thanksgiving dessert. 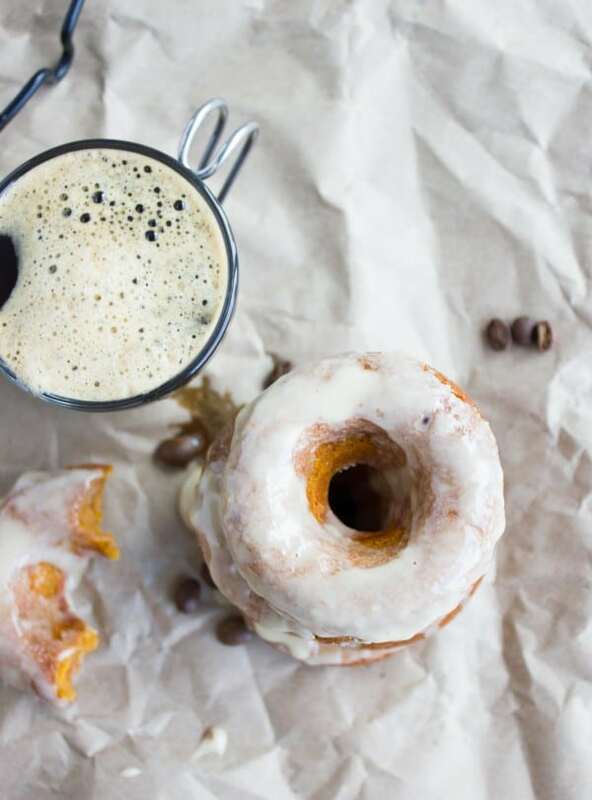 The sweet Espresso Glaze takes this seasonal pumpkin donut to the next level! These Espresso Glazed Pumpkin Spice Donuts are my favourite new seasonal treat. Picture them as a Baked Donut, which is tender, moist, and almost cake-like with a burst of pumpkin spice, featuring cinnamon, ginger, and clove. 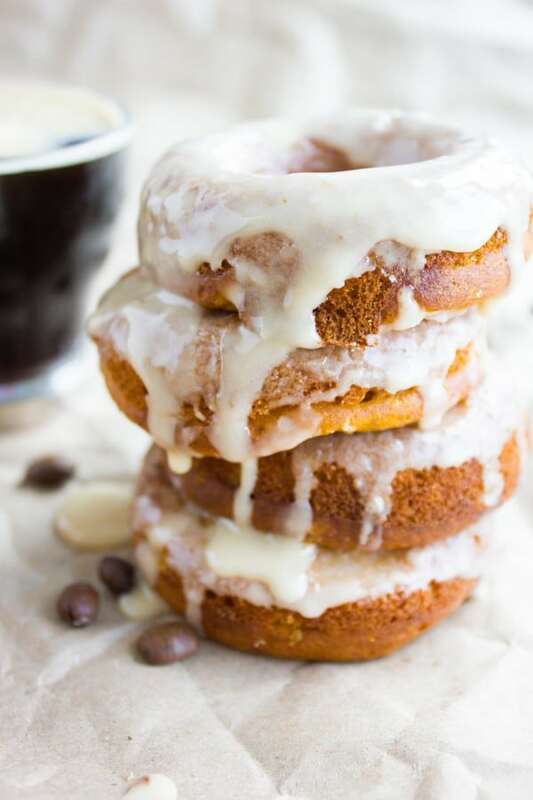 To finish it all off, a silky smooth Espresso Glaze covers these Baked Pumpkin Spice Donuts taking them to the next level! 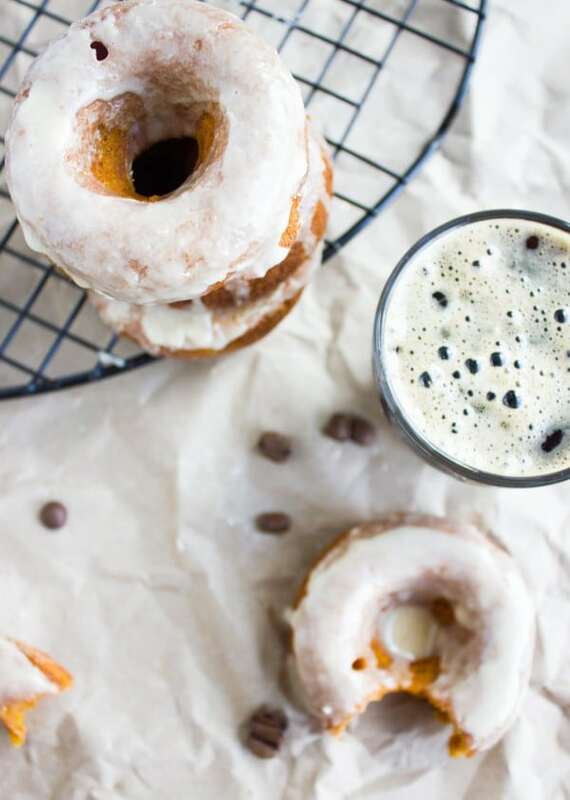 Now, these espresso glazed pumpkin spice donuts remind me of fall’s favorite drink—the almighty pumpkin spice latte. For all you pumpkin latte lovers—these easy baked pumpkins spice donuts will put a smile on your face! 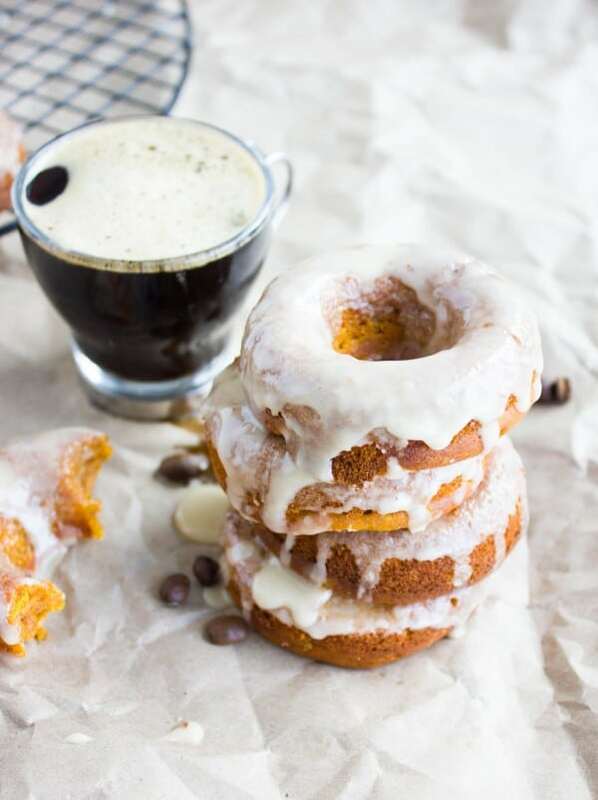 Now for those, who are not that much into sweet sweet Pumpkin Spice Latte, let me lure you into giving these moist and tender baked donuts a try—they might just have the perfect pumpkin-spice-espresso balance you were looking for! Since these baked donuts are pumpkin spice donuts in the first place, I will tell you the pumpkin flavor here is unbeatable! It’s sweet, strong and very pumpkin-y! The pumpkin spices are optional here. I love this warming seasonal spice blend, but the Mr. isn’t a fan, so I end up making these Espresso Glazed Pumpkin Spice Donuts with only half the spices the mix usually calls for—i.e cinnamon and ginger only. Now for the Espresso Glaze, feel free to use a classic vanilla icing like this cream cheese icing. I chose espresso because I love espresso anything (hello-0-0 did you forget these chocolate caramel Latte muffins?) and also because love the contrast of sweetness from the pumpkin and espresso. I love the way both flavors merge perfectly making these Baked Pumpkin Spice Donuts absolutely perfect. 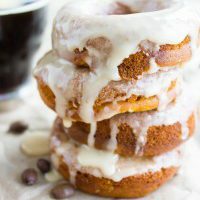 My Espresso Glazed Pumpkin Spice Donuts are not too sweet, so don’t worry about the glaze over-sweetening them and at the same time don’t worry if you skip glazing all together! I bake these Pumpkin Spice Donuts in a donut pan because the donut batter is more like a cake/muffin batter. It’s a thick batter so you can try to pipe the pumpkin spice donuts onto a baking sheet, lined with parchment paper). Keep in mind they might not all be identical in shape and size—unless you’re that good of a batter piper (which I’m not)! 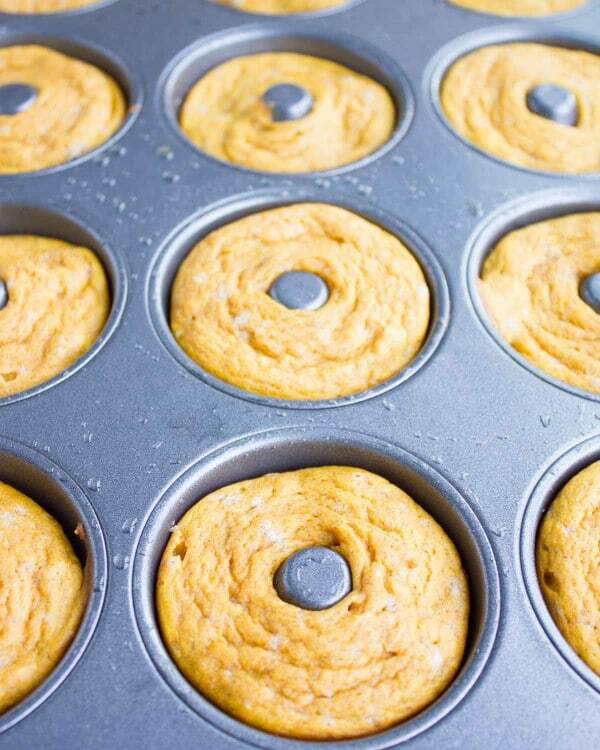 If you don’t have a donut pan, your second best bet would be to bake the batter spread thinly on a baking sheet (lined with parchment) and then, using cookie cutters, you can cut out donut shapes from the baked and cooled cake. 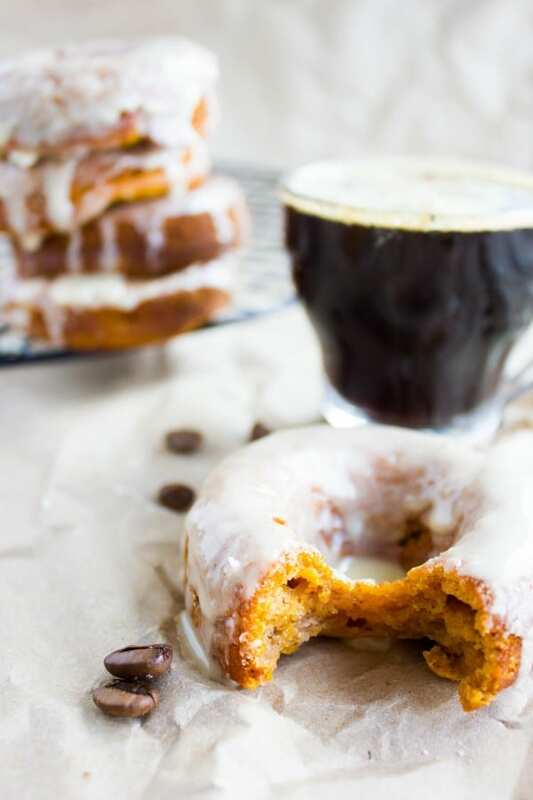 However you attempt to make these Espresso Glazed Pumpkin Spice Donuts, you will enjoy a pillow light, tender and moist baked donut with a burst of pumpkin spice and that sweetness of an aromatic espresso glaze! Skip the Espresso Glaze for a healthier, less sweet Baked Pumpkin Spice Donut. If you don’t have a donut pan, you can bake the donut batter spread thinly on a baking sheet (lined with parchment) and simply cut out pumpkin spice donuts using cookie cutters. You can use sour cream or regular yogurt instead of Greek yogurt. In a medium bowl, whisk together the flour, baking powder, baking soda, salt and spices. In a large bowl, mix the remaining ingredients and whisk them until well blended. Using a spatula, fold the dry ingredients into the pumpkin mixture until all blended. 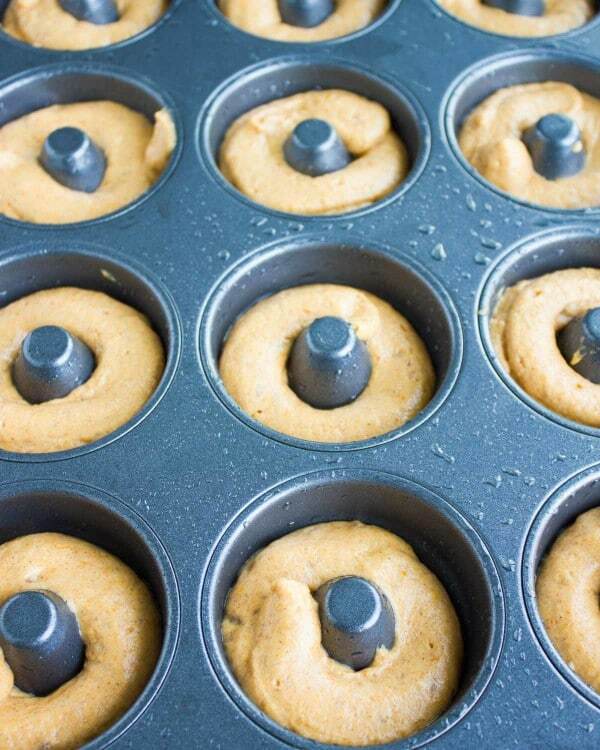 Place the batter into a piping bag and snip off the tip, then fill up the donut pan about 3/4th of the way. Bake the donuts for about 18-20 minutes (depending on your oven). In the meantime, make the glaze by whisking up the confectioner sugar and espresso until smooth. At this point, you can add more or less of the espresso to control the thickness of the glaze. When the donuts are done, let them cool down for 5 minutes before removing them from the pan. Dip each side of the donut in the glaze and flip it on a rack glazed side up, letting the excess glaze drip. This recipe makes perfect pumpkin muffins, mini pumpkin muffins too! If I wasnt such a nice mummy I wouldnt have left any for my kids! It was like survival of the fittest! We finished them all in one day! Even though the kids had it without the glaze and just ate one after the other… I couldnt believe my eyes! These picky little kids actually liked them! They LOVED them! And so did I! The only trick was not to mention they had pumkin untill they said it was yummy otherwise they wouldnt have touched them! Seriously delicious and a must try and rebake recipe! hahahahahahaha! I feel you!! I do that too 😉 My oldest one really loves them too which keeps me from espresso glazing them all! Goes well with my morning espresso! Use just cinnamon Karyl, I prefer sticking to cinnamon and a touch of ginger over pumpkin spice! There is nothing like the combination of donuts and coffee! What a brilliant idea to use espresso in the glaze – delicious! Three of the most popular words in my vocabulary these days. I love all things pumpkin spice and these sound delicious. My kids would love them especially the glaze. hahahahah my kids aren’t into espresso yet! I love that these donuts are baked rather than fried so I feel less guilty about going back for a second one! These would be perfect with a big cup of coffee! ooooh!! I love pumpkin and its spices!! I look forward to Fall just so I can indulge. And then you added the espresso flavor – it can’t get better than that. Now, all I have to do is get a donut pan.